To go along with the original Master Hamburger Mix which is for batch cooking pre-cooked hamburger, I usually take a few extra minutes to make the uncooked hamburger mix, which is great for meatloaf, hamburger patties, and meatballs. I usually purchase enough to make 2 meat loafs, a dozen or so hamburger patties and sometimes a batch of meatballs, (although I admit to being a Sams Club meatball cheater!). While my precooked hamburger mix is cooking in the oven in pans, I use this time to assemble my uncooked mix. 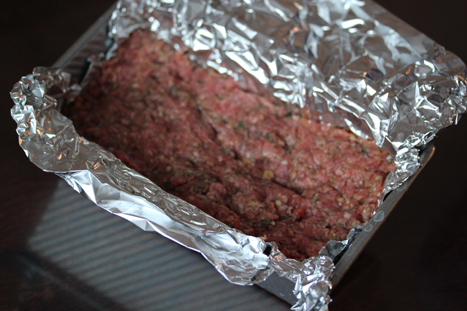 3) The third method, is to drape foil over your metal or glass baking dish with enough foil hanging over the sides to cover the meat loaf later. Freezer meatloaf in your pan. When frozen lift meatloaf and foil out of pan, wrap with the extra foil and put meatloaf back in freezer, so that it will pop back into the pan later when you are ready to cook it. oatmeal. Add tomato juice; mix well. 2. Add onion, salt, pepper and ground meat. patties), meatballs or meatloaf before freezing. at 350 F for 30 minutes. internal temperature of 165 F.